If you have watched the movie, A Dog's Purpose, you may be interested in recording the daily life from your pet's view. 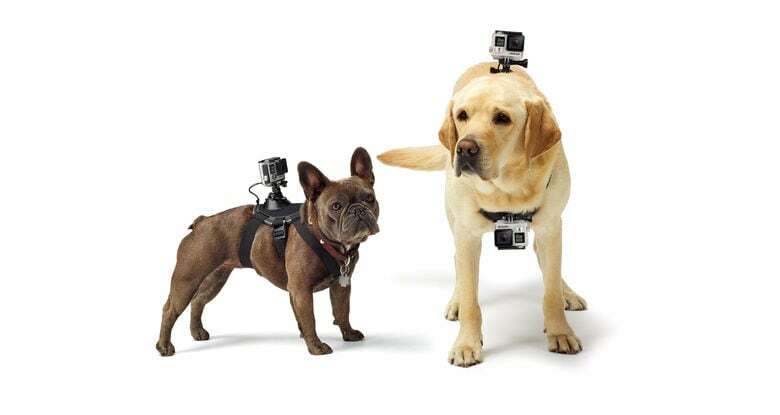 Well, with proper action camera and mountings for your pets, you can do it now. But you may be confused, because there are so many varieties of action camera mounts for your pet in the market. However, it is important to pick the right one to keep your dog comfortable all the time. Even if you don’t want to look on specific brands then also there are lots of options to buy. It must be washable and waterproof. You need to pick a mount that can suit your dog’s body type and can keep him/her comfortable while playing or running during recording hours. 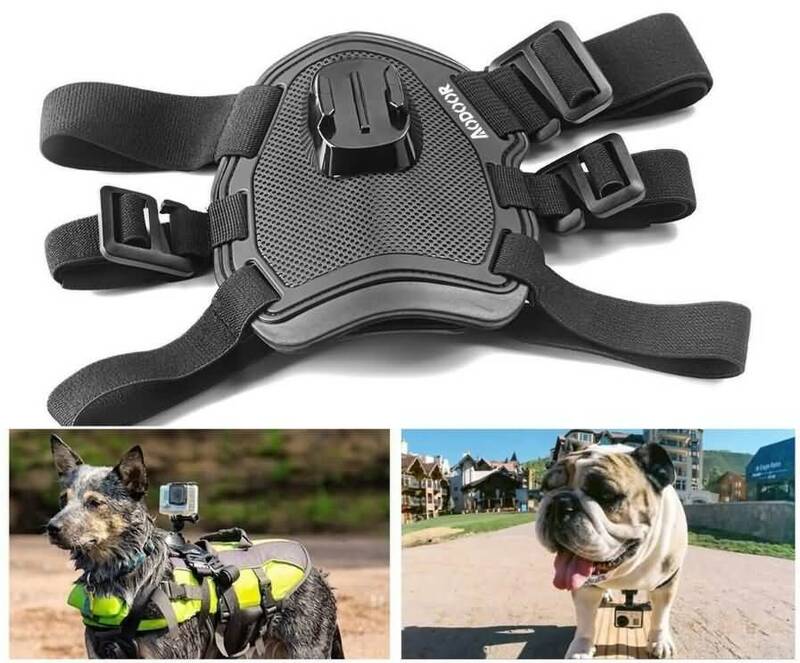 This harness features mounts on chest and back so that videos can be perfectly recorded when your dog is digging, bone chewing, playing or running. This harness fits perfectly to dogs having weight around 7 to 54KG. Soft and padded construction with comfortable fit. Made up of waterproof and washable material. The quick release buttons assist in easy removal of harness. Many people found footage recorded with this harness too shaky. Compatibility: Designed specifically for GoPro cameras. This harness is designed for dogs of medium and large size having minimum weight of 15Kg. It possesses four adjustable straps that make it comfortable and secure for your dog. Designed with light weighted and soft materials. The square shaped buckles may hurt your dog, so be careful. Compatibility: It is compatible with all Sony Action Cameras. It comes with chest and back mounting locations that assists in purposeful mounting needs. 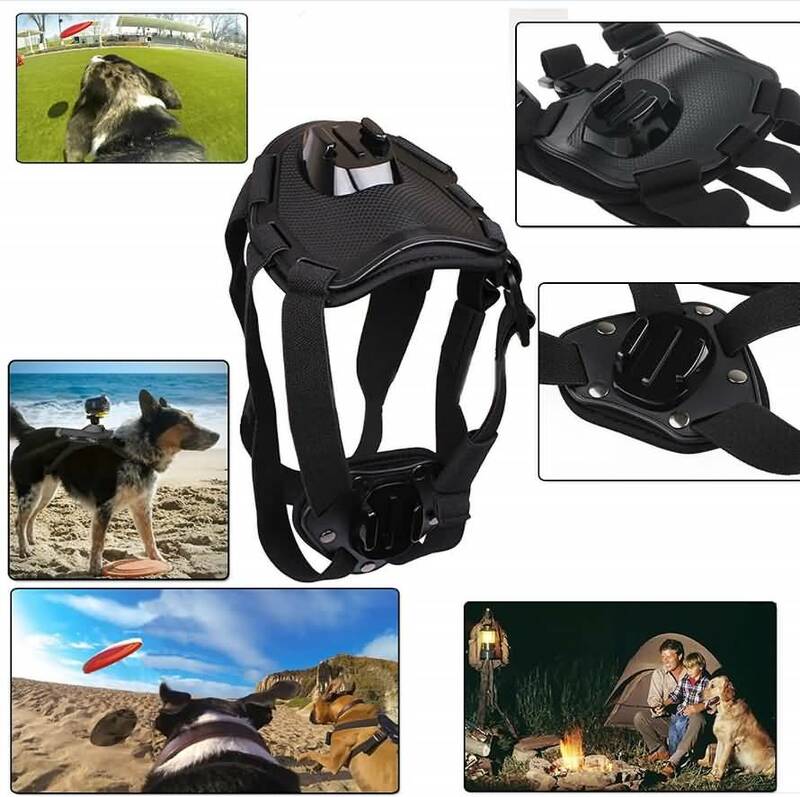 It is easily adjustable to dog having weight between 7 to 54Kg. Designed with high quality material that is durable and light in weight. Much easier to install and remove. 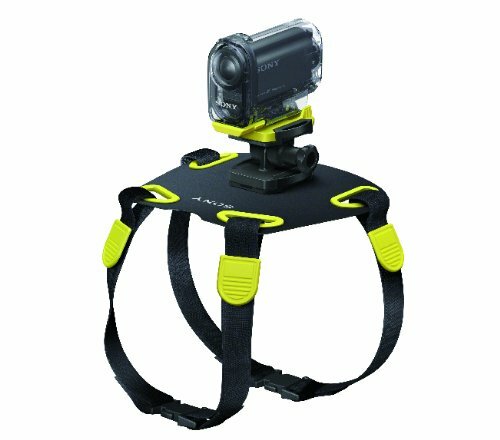 Compatibility: This harness is compatible with the Sony Action cam HDR AS100V, AS30V, AS20, AS15 and AZ1 Mini. This Tru-Fit type harness assists users to mount camera perfectly in back as well as chest of pet. It can catch videos with high clarity even when your dog is running fast. The five point adjustment system makes it stable and perfectly fir on your dogs body without creating any discomfort. Works perfectly with large size dogs. 5 point adjustment system makes it highly comfortable. It is not suitable for small dogs. Compatibility: Compatible with Sony Action Cam as well as GoPro series. This soft and padded chest strap can be easily adjusted to chest and back of your pet so that perfect shots can be captured when your dog is digging, running or playing. It can be used for dogs having weight somewhere between 7 to 35 Kg. Designed with padded arrangements so that dog can always feel comfortable. Comes with quick release type bases. Two mounting locations: Chest and back. It positions camera little high on back. 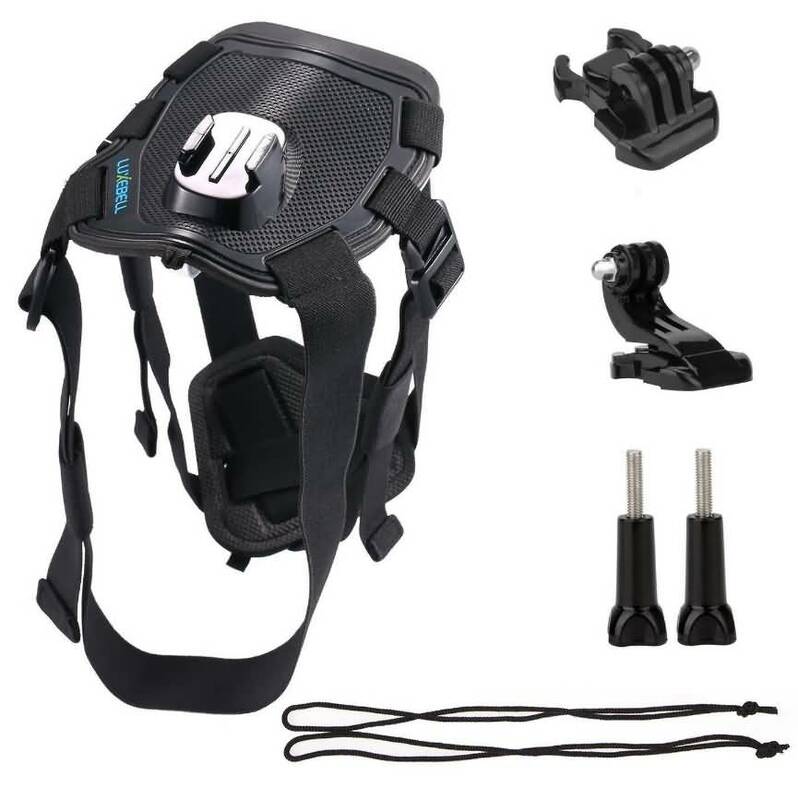 Compatibility: This chest strap type belt mount is suitable for all GoPro action camera models. Here is a fully adjustable harness for large, medium and small size dogs having weight somewhere between 7 to 54 KG. Its padded and soft design keeps pet comfortable while recording. If your dog is running fast then two secure tethers will provide perfect protection to your camera from accidental falling. It fits perfectly to all large, medium and small size dog breeds. Designed with water friendly and washable material. Camera may move on the back. 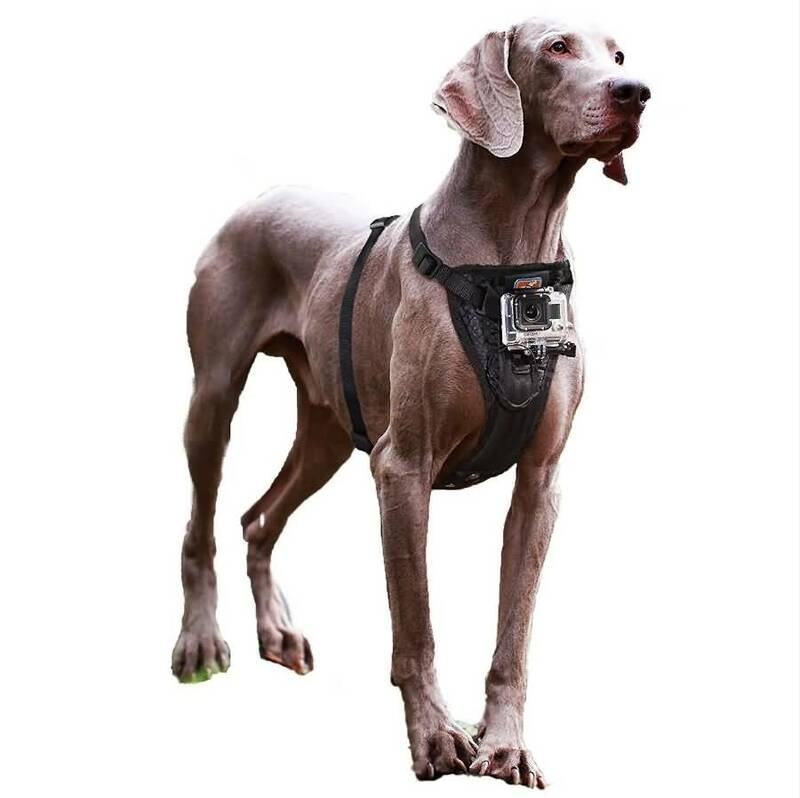 Compatibility: Luxebell Fetch Hound type Dog harnesses are specially designed chest mounts for SJCAM series: SJ4000, SJ5000 and GoPro Hero Black, Silver and Session series. The back and chest type control over POV settings. With quick release buttons it becomes much easier to attach and detach this harness from your pet. This harness suits to all size with its Tru-Fit technology. Comes with two mounts where location can be adjusted to chest and back to support variety of POVs. They are designed with washable and water friendly material. Durable and stable with quick to install mechanism. Back mount position often keeps camera at lower level as compared to dog’s head. It comes with two mounting locations, chest and back, which allows easy angle and direction adjustment. Its soft and padded construction is perfectly suited to dogs having weight between 7 and 54Kg. The quick release buttons and additional remote control strap will make usage much easier. 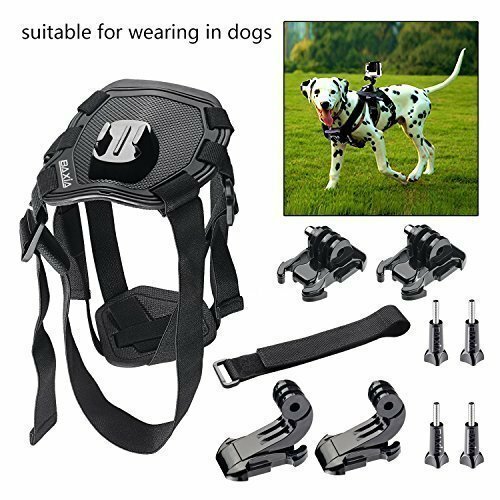 Much Cheaper than GoPro original dog harness. It possesses two mounting locations so that angle and direction can be easily adjusted. Made up of elastic so harness starts slipping when dog runs fast. Durability is lesser as compared to GoPro harness. Compatibility: It is compatible with ANART/ Aokon/ YI/ APEMAN/ DBPOWER/ Lightdow/ WiMiUS/ AKASO/ Xiaomi Yi/ SJ6000/ SJ5000/ SJ4000/ GoPro Hero Black, Silver and GoPro Hero5 series.